Growers and researchers gather in Ferndale, Wash., during the Technology Adoption Working Group’s Biodegradable Mulch Field Day. WSU researcher Jessica Goldberger leads the group, which works to study the impacts and acceptance of degradable plastic mulches. Sharing new ideas to help farmers grow crops more sustainably and curb our global dependence on wasteful, perpetual plastic, Jessica Goldberger, associate professor in the Department of Crop and Soil Sciences, gave the 2018 presidential address to members of the Agriculture, Food and Human Values Society. Sharing her team’s research on biodegradable mulch acceptance, Jessica Goldberger, researcher in the Department of Crop and Soil Sciences, gave the 2018 presidential address to the Agriculture, Food and Human Values Society. As past president of the Society, Goldberger offered agrifood scholars new ideas for future research on plastics, and showcased discoveries on how farmers could be encouraged to use biodegradable plastic mulch. 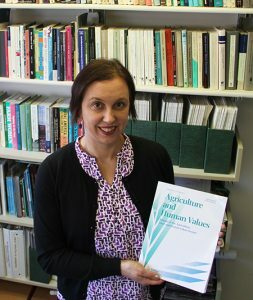 Her address is published in the December 2018 issue of the journal Agriculture and Human Values. U.S. agriculture uses about a billion pounds of plastic annually, and much of that material ends up in landfills, rivers, and oceans, and even our food, beverages, and bodies. 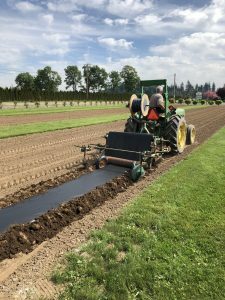 Biodegradable plastic mulches offer the potential to control weeds, retain moisture, and boost farm yields, but many farmers are hesitant to adopt them because of concerns over uncertainty, risk, and aesthetics. Goldberger leads the Technology Adoption Working Group, one of seven teams collaborating in a USDA National Institute of Food and Agriculture Specialty Crop Research Initiative project (http://biodegradablemulch.org) focused on performance and adoptability of biodegradable plastic mulches. Researchers lay mulch at Boxx Berry Farm in Ferndale, where WSU researchers are studying biodegradable mulches. Her group— a team of scientists in sociology, horticulture, economics, anthropology, and environmental psychology—is working to understand farmer attitudes and acceptance of biodegradable mulches. The team’s work highlights the need for improved products and new research on standards, best practices, ways to better attract organic farmers, and the presence of microplastics in agricultural ecosystems. “All of us—as human beings living in the Plastic Age—should take stock of the role of plastics in our day-to-day lives and consider changes to our relationship with plastics,” she said. At WSU, Goldberger works at the intersection of agriculture, sociology, and food systems, exploring the sources of agricultural knowledge, the spread of agricultural innovations, and the ways agricultural beliefs, choices, and practices affect rural quality of life, food security, sustainability, and the environment.